As an pet owner you will understand the normal behaviour patterns exhibited by your pet. Looking out for signs where your pet is struggling will help in its natural health. 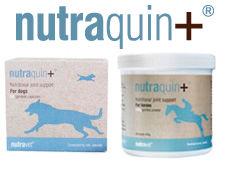 Maintaining optimum joint health is important for your pet's quality of life, thus supporting your pet with a vet recommended joint supplement such as nutraquin will help aid and soothe stiff joints, promote flexibility and support your pet's joint structure. Supplementation is also beneficial because as animals get older, the everyday pressures and stresses on joints can increase. For example, the production of glucosamine slows down, which is an essential building block of many parts of an animal's joints, including ligaments, tendons, cartilage and synovial fluid. It helps cartilage to act as a shock absorber thus aiding joints. Pain and lameness, stiffness - especially after a period of rest following exercise. An inability to perform certain tasks (such as jumping into the car or onto a chair). Cats will groom themselves less because they are sore and they may eat less, causing weight loss. Joints can become swollen or warm. Dogs and cats may bite at irritating, painful joints. There may also be personality changes or increased aggression due to pain. Talk to your vet if you are concerned about your pet's joint health. Your vet can carry out a thorough clinical examination to assess your pet and decide on an appropriate product and support programme.